Have a safe and candy-filled holiday! CC decided to go dressed as Capt. Jack Sparrow this year. Well, really the "girl pirate" version of that, anyway. It's fun to see her breaking out of the princess mold a little bit. 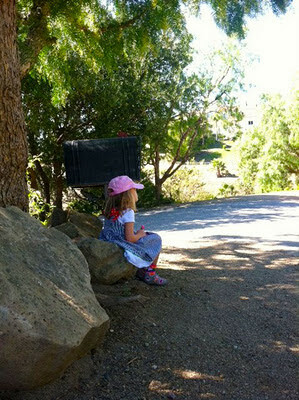 This morning before preschool, I snapped a pic of her while she was saying, "Yo ho ho, mateys!" -- her new favorite catchphrase. Lucky that we had a pair of pink and black Paul Frank socks to match! Back From Fort Worth, Texas! Howdy, y'all! I'm back from my adventure in Fort Worth. My friend Barbara got married this weekend at the gorgeous Fort Worth Botanic Garden. * The Stockyards just north of downtown are definitely worth visiting. 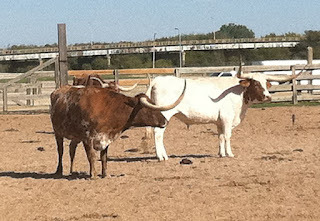 Every day at 11:30 a.m. and 4 p.m., cattle rustlers bring out the longhorn steers for a mini cattle drive along the main drag. They also have mechanical bull rides for kids of all ages. How funny is that?! * The Botanic Garden is so lovely. Barbara's wedding was in the rose garden on a beautiful Saturday afternoon. * I also visited the National Cowgirl Museum and Hall of Fame. What an inspiring place for little (and big) girls. 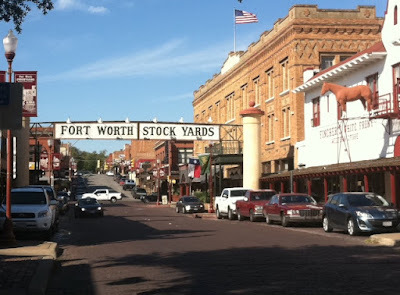 Fort Worth also has a lively downtown life for visitors who'd rather grab cocktails instead of cattle. Check out Antonio Banderas as the voice of Mr. Puss in Boots in this DreamWorks animated film about the legendary cat. CC has been asking and asking and asking to see this movie, and now that the billboards are everywhere, I'm hearing about it even more. This movie, which also features the voices of Salma Hayek and Zach Galifianakis (love him! ), is the story of Puss's adventures before he meets Shrek, Donkey and the gang. 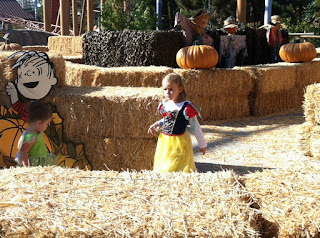 While the animals might not know what all the costumed fuss is about, kids are sure to get a kick out of all the Halloween activities on offer at the L.A. Zoo this weekend. From trick-or-treating to face-painting to creepy creature encounters (spiders! snakes! did I mention spiders?! ), there's lots to do for little ones. They can even check out snow leopards, gorillas, elephants and others chewing on pumpkin treats. And speaking of Puss in Boots, he and Kitty Softpaws will be on hand from 10 a.m.-3 p.m. each day. Click here for more info. 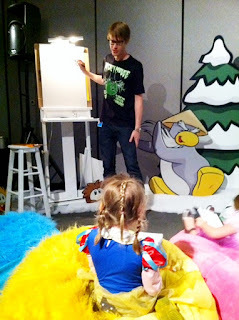 CC learns to draw a penguin at the Disney Interactive Halloween Bash. Getting an early start on Halloween fun, Disney Interactive Media hosted a costume-friendly party at the Walt Disney Studios lot in Burbank. 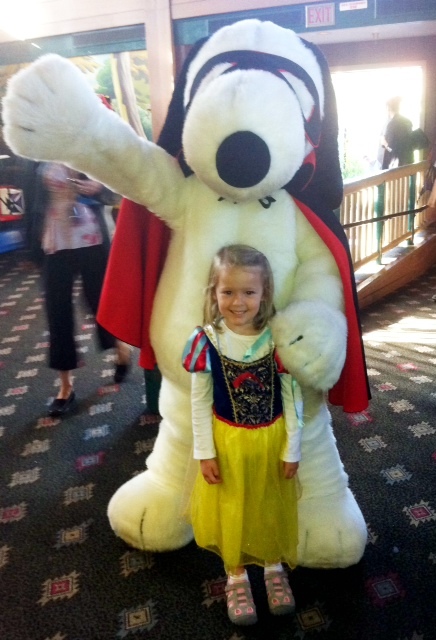 In addition to donning her Snow White costume (we just got her a Capt. Jack Sparrow outfit for this year), CC decorated cookies, added a Mickey Mouse face to paper bats (the flying kind), played online games and learned how to draw a penguin, courtesy of a Club Penguin artist. Of course, at any kid-friendly party, desserts tend to come first. 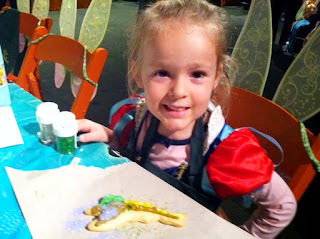 The cookie-decorating station was first on CC's agenda, and Tinker Bell was her design du jour. That came just before she visited the Pixie Hollow station, where she was able to dress up a variety of virtual fairies online. CC gets her sweet tooth from somewhere (*ahem*), and mine led me to the DisneyFamily.com table, where adorably decorated desserts were on display. 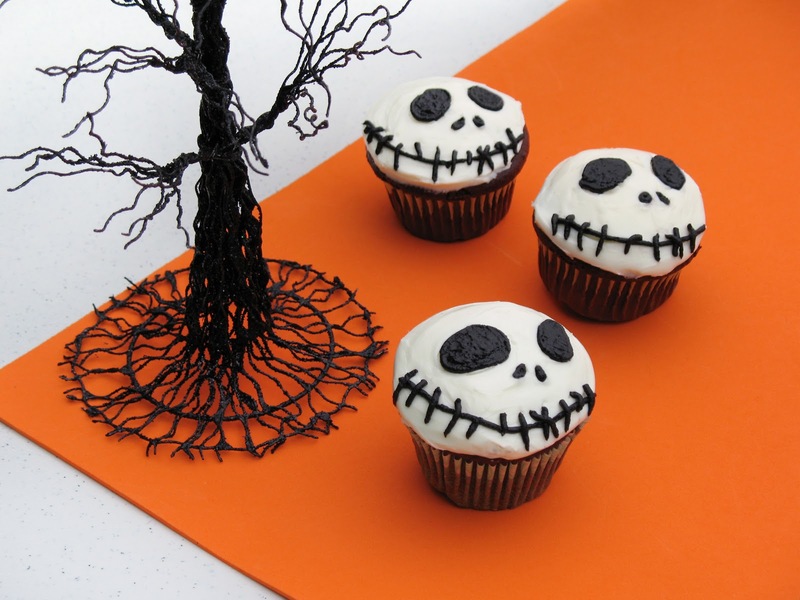 What I loved the most were the Jack Skellington cupcakes (see below). Click here to get the directions. We had a wonderful time checking out the games (and getting a sneak peek of Disney Universe). There's always something special about being on the Disney lot. I don't know if it's the movie costumes on display, the building that features the (ironically large) seven dwarves as part of its architecture, the animation cells from "Snow White" or just knowing how much creativity has come from inside those gates. Whatever it is -- pixie dust? -- CC had loads of fun and drew the best penguin I've ever seen. 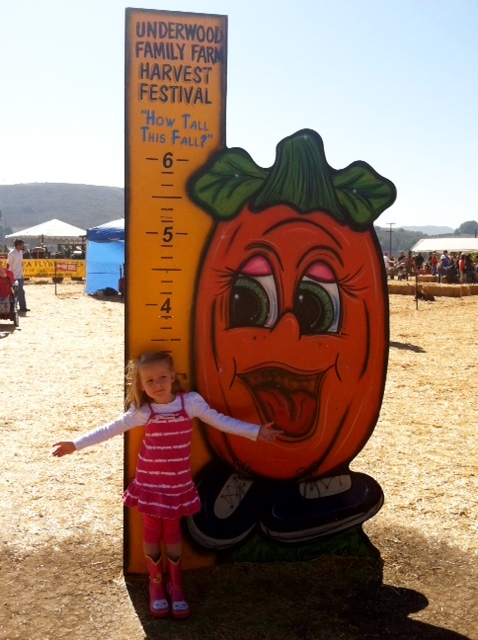 CC dives into pumpkins at Underwood Family Farms. It's pumpkin season again, and you know what that means! This was our second year to head to Underwood Family Farms in Moorpark, and we had a lovely time checking out wagon rides, tractor slides and, yes, pig races. CC loved playing in the various kiddie areas, particularly on the wooden train and underground tunnels. 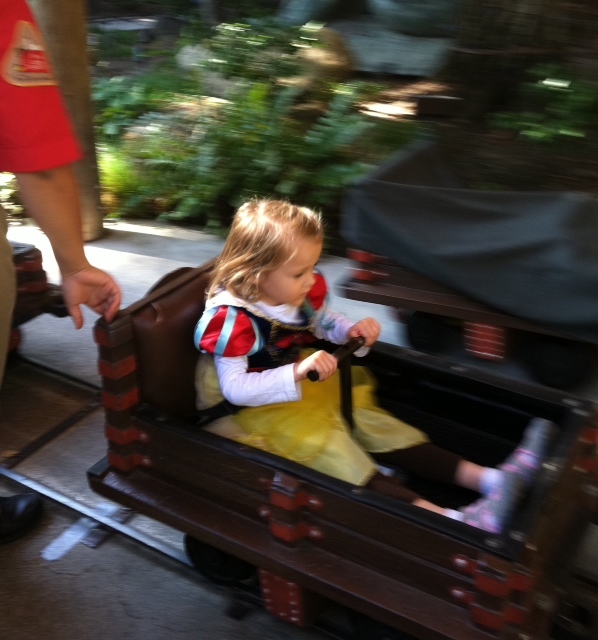 But it was the wagon ride (for all ages) and the cow barrel ride (for little ones) that served as her main highlights. That, and the pumpkin pie. Underwood Family Farms is such a beautiful, family-friendly place located in such an idyllic spot. It's full of wide open spaces, and you can also admire the rolling hills of Ventura and Los Angeles Counties. I actually decided to take a different route this year, ditching the freeways and taking the road less traveled. And it definitely made all the difference. I took the PCH to Malibu Canyon Road and drove through the rugged mountains and hills to reach the San Fernando Valley on the other side. It was truly magnificent, as sunlight shone down on the winding roads and natural landscape. Visiting Underwood Farms has definitely become an October tradition, and I already know my route for driving back next year. I love scouring the Internet for cool finds. There are so many amazing websites and small retailers out there, and I'd like to share some of my discoveries. So I'm starting this new feature called Friday Finds, and I'll link to family-friendly items, stories or events that I've found particularly enchanting. 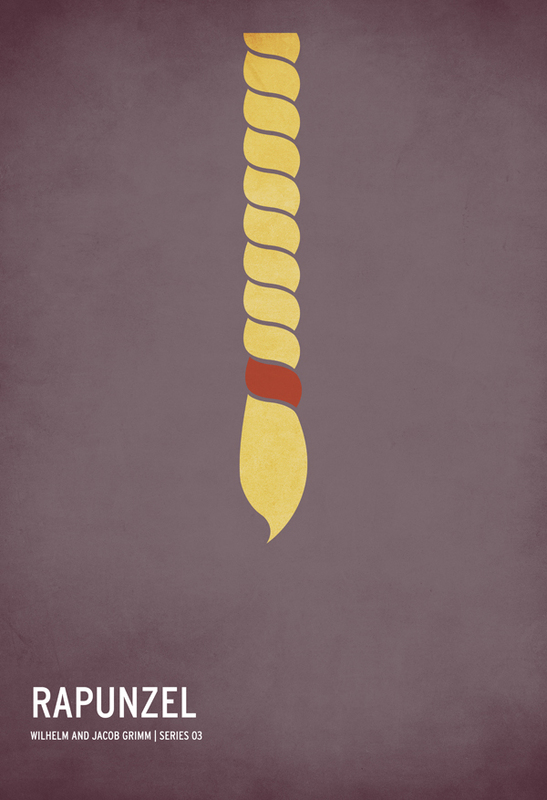 * Take, for instance, the above poster by Christian Jackson. It's one in a series of classic fairy tales reinterpreted from a minimalist perspective. (Hat tip: Cup of Jo) He's also a working dad and has a clever infographic about the challenges that come with that role. * How awesome are these DIY mini piñatas? * These would be an adorable addition to a baby's room. * Do you dress up to drop off your kids at school? * Get ready for The Nightmare Before Christmas! 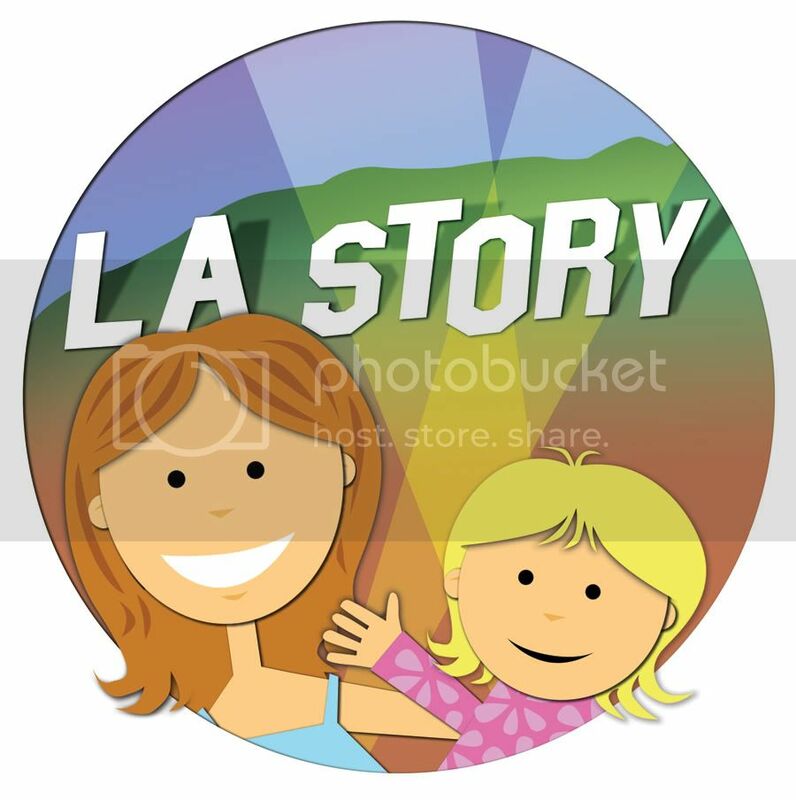 * Check out this family festival to celebrate L.A.-centric Pacific Standard Time exhibits. * As National Anti-Bullying month continues, kids can take a peek at a special episode of "The Adventures of Chuck & Friends" on The Hub (Monday, Oct. 24, 7:30am PT) that shows tykes a way to deal with bullies. Not only is learning to swim a great way to bond with your children, great exercise, and fun for the entire family, it's also a lifesaving endeavor. 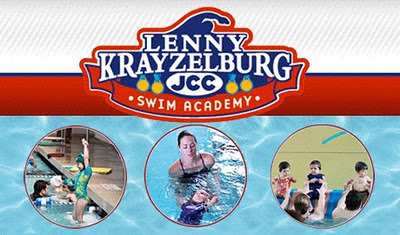 Take advantage of today's deal for a $200 swim lesson credit at Lenny Krayzelburg Swim Academy for just $100. As one of Los Angeles' premiere swim schools, instructors will take students from the beginning stages of swimming all the way to learning all 4 strokes, freestyle, backstroke, breaststroke and butterfly. Classes are available for every age range, and instructors work with your child's individual needs to ensure success and safety in the water. The Lenny Krayzelburg Swim Academy offers a learn to swim program for children of all ages. Started in 2005 by 4 time Olympic Gold Medalist Lenny Krayzelburg, the school's core purpose is to teach and inspire children to be water safe. Since its inception, the school's instructors have taught thousands of kids water safety and the importance of knowing how to swim. Using the SwimRight Method, they utilize the swim-float-swim technique as their foundation, and focus on providing children with the knowledge of confidence and safety in and around the water. From these basic skills, instructors take students from beginning stages of swimming all the way to learning all 4 strokes, freestyle, backstroke, breaststroke and butterfly. The Academy offers a variety of classes to meet every parent's need. From parent tot classes, private lessons, group classes and stroke development, you can find it all here at the Lenny Krayzelburg Swim Academy. October is Breast Cancer Awareness month, and there are many ways that you can take part. Whether it's donating time, funds or support, this is definitely a cause worth getting behind. With that in mind, I wanted to pass along some information about a fun, Napa Valley event, Live in the Vineyard, which is hosting an eBay auction benefiting the City of Hope comprehensive cancer center. Taking place Nov. 5-7 and featuring live musical artists including Daughtry, Michelle Branch and O.A.R., Live in the Vineyard will also combine food, wine and other activities. If you're looking for a getaway, while also wanting to donate to a worthy organization, this is an awesome opportunity. In fact, I wish I could do it myself. Good luck! 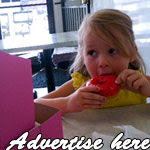 For other ways to support breast cancer research, click here. We've heard about it from frustrated parents. We've heard about it from curious filmmakers. And now we're getting the lowdown on how to combat the menace of girl-against-girl bullying from a couple of enterprising young women who have founded a nonprofit organization focused on playing nice -- the Kind Campaign. Molly Thompson and Lauren Parsekian wanted to put an end to the damaging "Mean Girls" mentality -- we've all been there! -- that regularly breaks down girls' self-esteem, so they created both a documentary ("Finding Kind") and a genuine movement. They've even partnered with Mattel's Monster High, a brand of teenage dolls that are the kids of famous monsters (Draculaura is one! ), and got "monster-fied" in a special webisode to spread their message to tweens and teens. 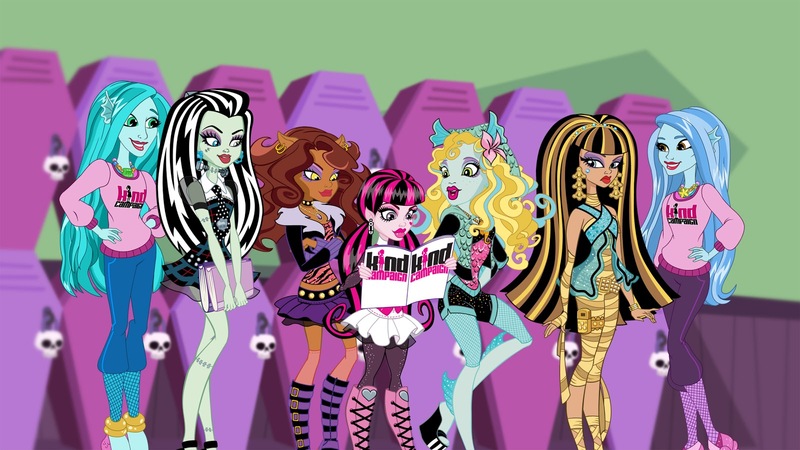 It makes for a great match because Monster High is all about being proud of yourself and your unique sensibilities. 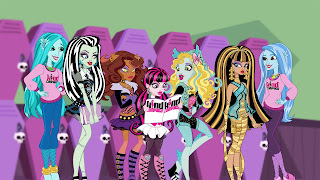 Kind Campaign visits Monster High. The duo also made the rounds to cities including Los Angeles and invited mothers and daughters to share in a screening of "Finding Kind" followed by a frank discussion about bullying. This is such a worthy endeavor from a pair of thoughtful young women. And while this movement is focused on tween and teen girls, I think it's never too early to start teaching our daughters to be kind. CC is only 4 years old and finishing up preschool this year, but I've already heard stories about girls excluding girls in her classroom. I don't know what it is or why that happens -- especially in children so young. Luckily, we're very happy with CC's teachers, who refer to all of her classmates as "friends" and work hard to promote sharing and playing together nicely. After all, as parents, we all want our children to play nicely with others, to build up their friends' self-esteem, and to just be kind. I'm happy to see that girls all over the country have a couple of talented role models in Lauren and Molly. Check out their Facebook page here and their Twitter feed here. Got milk? If not, you might want to head over to your local grocer and pick up a gallon or two. Continuing through Dec. 31, the sweepstakes invites families to collect Real California Milk labels from milk and dairy products to give to their teacher. Each label acts as a sweepstakes entry. The more they collect, the more opportunities the school has to win. And families not only will be helping their school's chances of winning. They also will be helping the more than 1,600 California dairy farmers with each purchase. Not bad! We are definitely a milk-guzzling family. In fact, while Ian and CC prefer 2%, I always opt for skim. So there are always plenty of cartons in the refrigerator. And it's extra wonderful to think that we can help our local school by doing something we do every day. What school -- especially in Los Angeles, where there have been so many cuts and layoffs -- couldn't use the extra funds? While some schools are looking to beef up on their technology (hello, iPads! ), others want to keep valuable library personnel to help children navigate the world of books and scholastic research. So drink up, SoCal families! Because, oh yeah, milk is also great for you! There was no shortage of snow last week at Sony Pictures Animation in Culver City, where CC and I caught sneak-peek footage of "Arthur Christmas." Filling the grounds with the holiday spirit, Sony invited carolers to sing songs while kids grabbed handfuls of the icy snowflakes and decorated cookies and crafts. Just after CC met a new little friend and boarded a sleigh pulled by several (faux) reindeer, we headed over to a screening room where we caught some scenes from the animated movie, which arrives in theaters Nov. 23. Ashley Jensen, one of several talented Brits lending their voices to the film, was also in attendance. CC, right, and a friend board a sleigh at Sony Pictures Animation. You might have caught an early trailer of the film if you saw "The Smurfs," also from Sony, in theaters. We did and, to be honest, I wasn't quite sure what to make of the movie. Now that I've seen about 20 minutes of the film, I have to say that CC and I can't wait for it to arrive. "Arthur Christmas" is the story of the younger, bumbling and Christmas-sweater-loving son of Santa Claus. 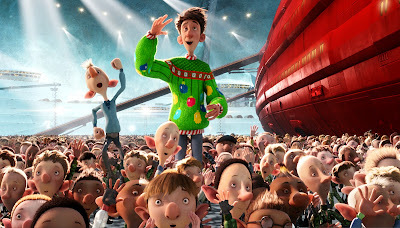 Voiced by James McAvoy, Arthur wants every child to believe in Santa and the Christmas spirit. While he's the heart of the operation, his older brother Steve (Hugh Laurie) is the brains. Steve's got Christmas Eve present-giving down to military precise operation. And there are some serious G.I. Elves here. But there's one problem. One child -- a girl who's on the fence about the existence of Santa -- gets left out by elf error. And it's Arthur and his GrandSanta (Bill Nighy) who want to make things right. The old-fashioned way. The scenes CC and I saw were a true delight. They were funny -- CC laughed out loud at the slapstick -- while I was impressed with some clever visuals (one reindeer has a cone collar) and that the elves measure children's "goodness" or "badness" in percentages. It was also very touching, which makes for a great holiday mix. 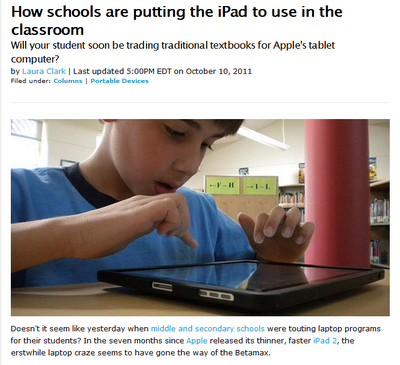 Please check out my latest article on Tecca.com, "How schools are putting the iPad to use in the classroom." It's really amazing to see how quickly schools across the country -- public, private and parochial -- are adopting this new device. Does your child's school have an iPad program? Get the kids off the couch and into their play clothes for a day of fun and excitement at Little Barn, an expansive indoor playground in the heart of Los Angeles. Check out the bounce house, ball pit, slide, climbing wall, swings, tows, coloring stations and more. Hungry? Check out their huge selection of healthy snacks. 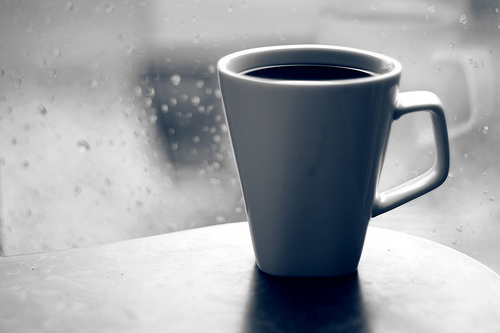 They also serve a variety of coffee drinks for parents that need a caffeine fix. 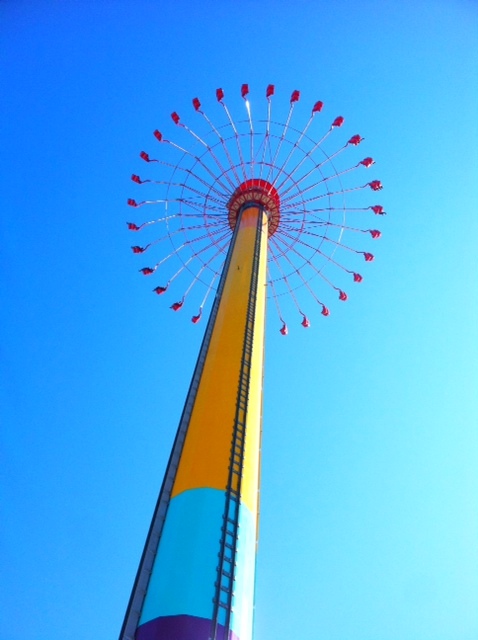 Today's voucher is good for a monthly unlimited play pass for just $18 - a $60 value. 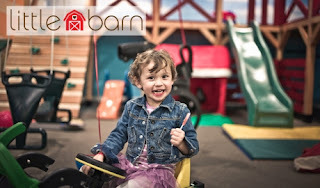 The Little Barn also offers music classes and birthday party packages. The Little Barn is a dream come true. The owners are working moms who do it all. If you know what that feels like, you know the importance of being able to spend your treasured hours with your children in a safe, fun yet relaxed environment. This can be very daunting when you've got a list of things to do, errands to run and only that one block of time in your day that you are going to give the gift of play to your children and hopefully some relaxation to yourself. Out of their desire to have that one perfect place in those few treasured hours came the Little Barn. The Little Barn takes cleaning seriously. They have one of the cleanest ball pits on record and use the patented UV Super Mini by HyGenie to clean and disinfect. Check their website for the rest of their cleaning methods and prepare to be amazed. Ethereal acrobats. Levitating aerialists. Curvy contortionists -- Welcome to Hollywood! You should feel right at home. "Iris," Cirque du Soleil's new production based at the Kodak Theatre in the heart of Tinseltown, is a delightful and surreal voyage through the history of cinema -- an appropriate homage given its permanent location. I had the chance last week to check out the show at Blogger Night, along with some of my L.A.-based bloggy friends, and I came away thinking just how weirdly (in a good way) talented these people are and how rare this kind of performance art actually is these days. On the surface, "Iris" (written and directed by Philippe Decoufle) tells the story of a lovestruck couple -- a very limber young man named Buster and a beautiful starlet named Scarlet (pictured below) -- who have a difficult time connecting after they're thrown into a world of film. Of course, in the Cirque world, as well as in Hollywood, there are more than few distractions to trip up any potential pair. All the while, the audience is along for the celluloid-friendly ride, as dancers, acrobats and contortionists -- as well as cleverly costumed performers, such as the Praxinoscope woman above -- glide, flit and drift onto the stage for their figurative 15 minutes. Black-and-white, noir, action-adventure are all on stage, complete with specially placed cameras to film the action as it's happening, creating a hypnotic backdrop to actual live action. Danny Elfman's score adds a dramatically dreamy sense to the occasion as well. Some highlights include twin aerialists who swing and spin what seems like miles above the audience; a group of acrobats dressed as colorful insects who perform physical feats of flipping that you wouldn't believe; as well as a gangster number that involves cleverly placed trampolines. And, of course, given its subject matter and Academy Awards venue, there's a fun Oscars spoof. So, parents, I know you're wondering if children are welcome. 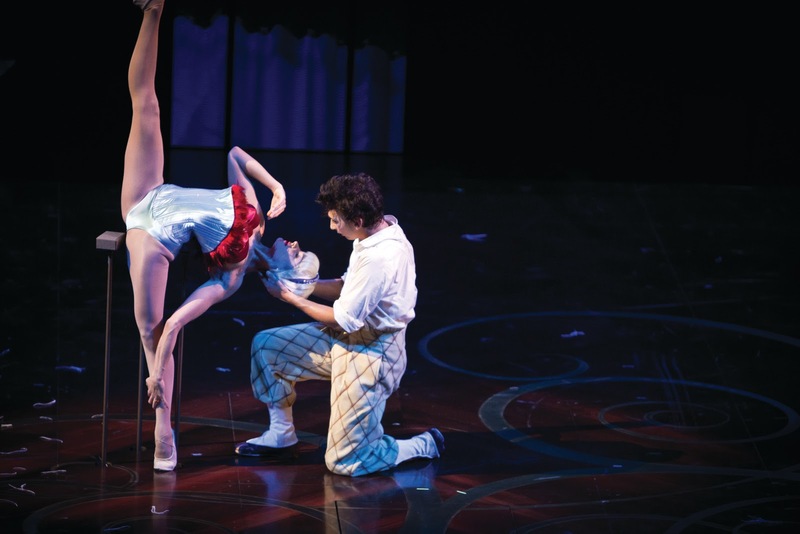 As far as Cirque rules go, the show is recommended for ages 5 and older. I have taken CC to see another Cirque show, "Kooza," which she loved, and I would love to take her to see "Iris," because she would go crazy for the dancing and the visually stunning tableaux. It's a dazzling tribute to film that pokes fun while honoring the place where it all got started. UPDATE: Congrats to yellowismyfavorite, who won the Box Creations Cottage Playhouse from Totsy! Please email me at losangelesstory@gmail.com with your address. Thanks to everyone who participated (and to Random.org for its rad-yet-ruthless decision-making skills). Stay tuned for more! As deal-seeking parents (who isn't one? ), you might already have heard of Totsy, the online private-sale site that offers clothing, accessories and other gear for the family. And these are awesome sales, too -- up to 90% off. If you haven't, check them out here and on Facebook here. You might find an adorable elephant rocker on sale for almost half off or festive holiday dresses for girls marked way down. It's a great way to pick up cute items without having to deal with the usual sticker shock. 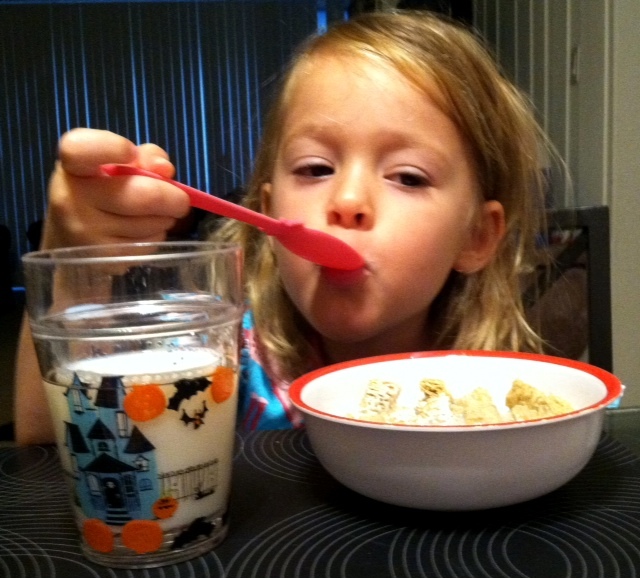 Well, lucky L.A. Story readers, Totsy is sponsoring today's awesome giveaway. 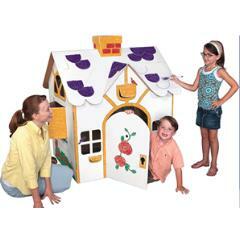 They are giving away a Box Creations Cottage Playhouse (retail $39.99; pictured above) to one of my lovely readers. To enter, please visit Totsy to become a member. (It's free, and you can invite friends to receive a $15 credit once they make a purchase). Then leave a comment below. Good luck, and I will announce the winner on Friday, Oct. 28! The fine print: No refunds or exchanges allowed for the prize item, and Totsy will ship the prize to the winner. It's finally here! LA Weekly has published its annual "Best of LA" edition, and besides getting the downlow on awesome places around the city, you'll also spy a familiar name among the contributors. Yes, yours truly has added her two cents on what to check out in Los Angeles. Coffee bar meets indoor play space for kiddos. Want to plan the perfect getaway? Trainiacs of all ages can hop on board here. Or looking for some sweet kicks? How about a retro shave, dads? There are a ton of great tips on where to be a tourist in your own city, so be sure to pick up a copy. 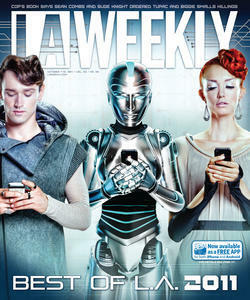 Not only that, but, as always, the Weekly is free! CC plays with the Toy Story Buzz Lightyear Spaceship Command Center. UPDATE: Congrats to ryanac32, who won the Buzz Lightyear Spaceship Command Center and Space Figure! (And thanks to Random.org for helping me decide.) Please email me at losangelesstory@gmail.com with your address. This was an amazing giveaway, and thanks to everyone who participated. Stay tuned for more! Mattel and Disney really are taking the "Toy Story" crew to infinity and beyond with their new space-centered toy line. With the Toy Story Buzz Lightyear Spaceship Command Center ($49.99; pictured above) and Toy Story figurines, including Woody, Buzz Lightyear, Rex and Zurg ($10.99 each), kids can have a blast using their imaginations to create fun space missions. CC had the opportunity to check out the space station and the Woody figurine, and from the moment we unwrapped all of the twisty-ties and tape from the box, she was making up little space missions of her own. There's even a little voice amplifier that lets her order her space minions around the ship. The Woody space figure zooms around on a rover vehicle. I received this package for review as part of the Mattel Disney Insider program that I belong to, and while I thought it was a cool toy, I wasn't sure if my princess-loving daughter would adopt it with such enthusiasm. But she did! There are lots of fun noises and compartments, and she was rolling it around our wood floors when she wasn't using it as a command center. Mattel also created a "Toymation" stop-motion short movie that can be a jumping-off point for children's imaginations. Chances are, though, they'll know exactly what to do once they get their hands on the toys. Here's the extra awesome part. 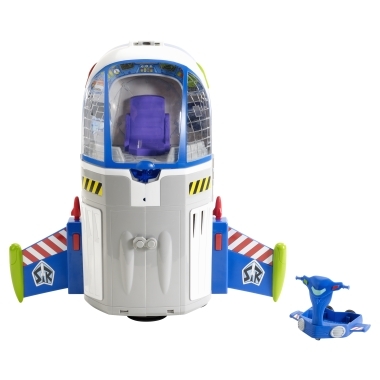 I'm giving away 1 Toy Story Buzz Lightyear Spaceship Command Center and 1 Toy Story Space Figure. To enter, please leave a comment telling me your child's favorite part of the "Toy Story" films. Good luck, and I will announce the winner on Wednesday, Oct. 19! It's that time of year again. Every October, rain starts pounding the pavement in Los Angeles. It's always a nice change from the scorching heat of summer. It even reminds me a little of the East Coast. Today, as thick, gray rain clouds hovered overhead and fat drops fell on the sidewalks, I bundled up CC in her pink kitty raincoat (complete with ears!) and rain boots. She loved it, especially now that she gets to splash in puddles. I started off the morning with a big cup of coffee -- perfect on any rainy day. 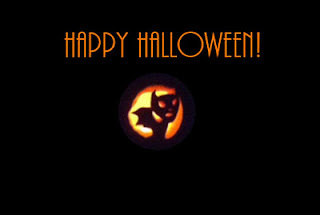 What a great way to kick off October! CC, Ian and I were invited down to Camp Snoopy, er, Camp Spooky at Knott's Berry Farm on Saturday to enjoy a little Halloween excitement -- and a little fright. 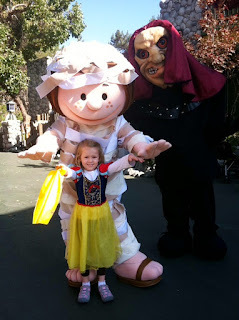 After kicking off the festivities with breakfast at 8 a.m. (waking up CC at 6:30 a.m. to get down to Orange County in her Snow White costume was a little tricky but definitely worth it), we met up with some familiar yet costumed characters before we hit the (little) kid-friendly rides and attractions. CC pushes and pulls on the Huff and Puff. CC with Peppermint Patty & a scary dude. 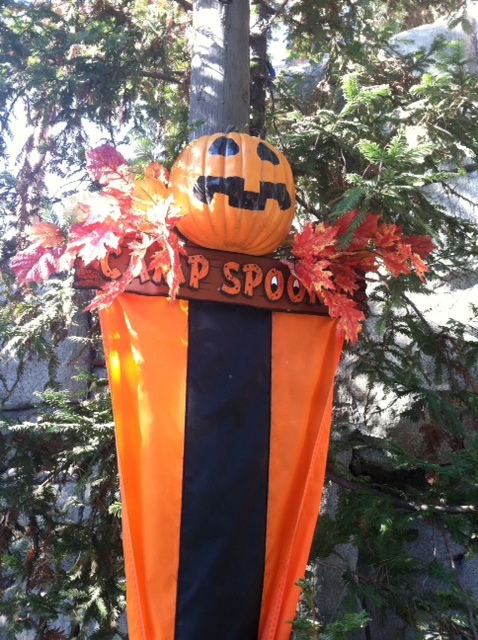 Kids who visit Camp Spooky will each receive a little trick-or-treat bag to fill up with candy at various stations around the park. There are also crafting activities and a live show from fave Peanuts characters. Oh, and grown-up kids can have just as much fun, too. Ian was eager to hit all of the crazy thrill rides before the park got too crowded. (I used to be this way too, but something happened -- I think it was giving birth.) 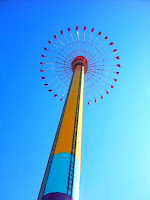 He rode the scary roller coasters and even swung over Knott's in the 300 ft. tall WindSeeker (right). Eek! Fright is right!